Tasseled handbag by Annalea Mills. Photo and styling by Jennifer Ritchie. The handmade leather designs of Annalea Mills in her studio shop, English Harbour, Antigua. Photo by Jennifer Ritchie. Belts by Annalea Mills. Photo and styling by Jennifer Ritchie. 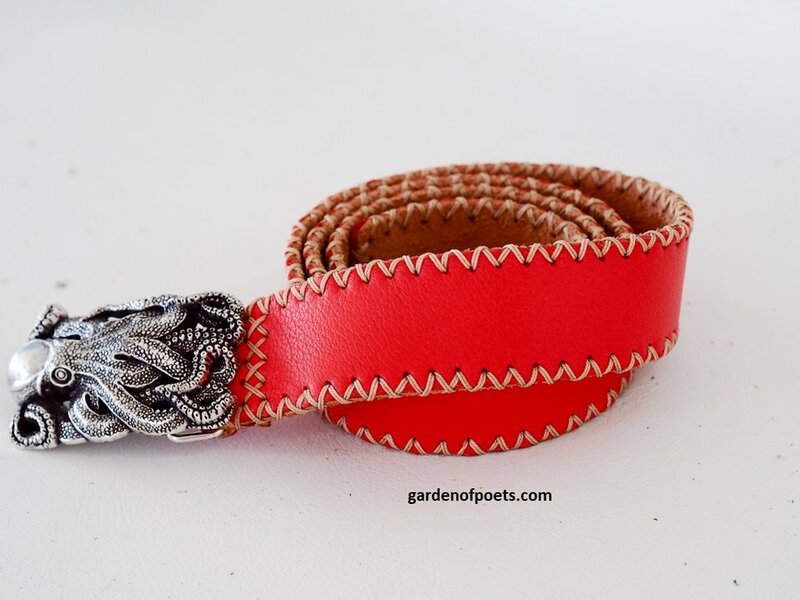 Handmade leather belts by Annalea Mills. Photo and styling by Jennifer Ritchie. Handmade leather wallet by Annalea Mills. Photo by Jennifer Ritchie. When she was 24, her Great Uncle Ernest passed away and she inherited his boat 'Irene Anne' (named after her great grandmother) and since then she has kept and maintained the yacht and it has been her home, now shared with her partner and son Marlin. "I could never sell the boat" she says, "it's who I am and why I'm here". When her son was 6 months old, the little family moved into a house on land, but she hated it. "We don't have any things, we live on boats. I feel trapped in a house". The one consistent thing has been her leatherwork. "I love it. Every job is different, challenging. It is fun to be tested, to work out how to get the leather to go where it doesn't want to go! Covering wheels, dinghy chocs, making hatch cover pockets, winch handle pockets ...."
Last year she took the big step to opening her own studio in English Harbour, where customers can come in and see her designs and watch her working first-hand. She has a beautiful selection of leather available also. I asked her what colours are trending? "We don't live in the fashion world here," she tells me, "I choose colours that suit here. I choose Italian leather that has been tanned beautifully and consistently. Tiffany blue and turquoise - people are instantly attracted to them, persimmon and emerald green .... some leathers have different textures, soft and tactile or stiffer." Leather swatch in Annalea Mills studio, Antigua. Photo by Jennifer Ritchie. How does a day in the life of Annalea look? "I get to the studio early and sweep the floors. I love the moment of opening the doors to the world. I usually have a piece of work waiting, something unfinished from the day before. When that is completed, I pick a colour of leather and cut and punch and stitch .... "
If you would like to contact Annalea to commission work or ask about her designs, you can email her at annalea_mills@hotmail.com or telephone +1-268-788.1445, mentioning that you found her story here at The Garden of Poets!